Where did you get them teeth?! Take that crap out yo mouth! 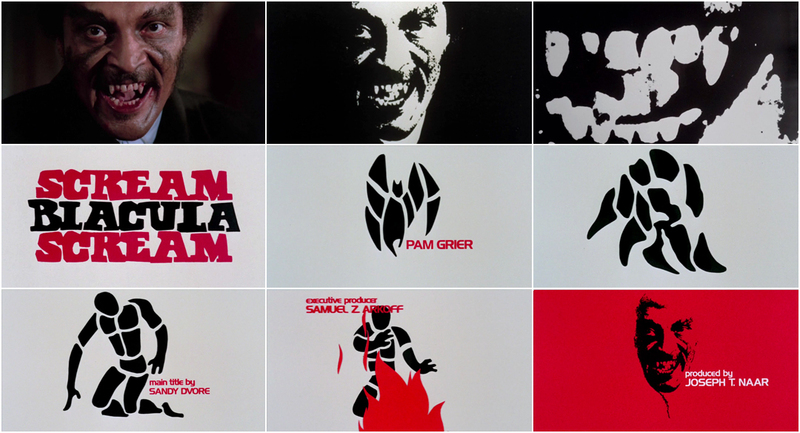 In the title sequence for 1973's Scream Blacula Scream, designer Sandy Dvore borrows from his own previous work to create a graphic opening of stark colour and sharp teeth. In this sequel to 1970's wildly successful Blacula, Dvore's opening combines the colour and tone from the original film with the graphic simplicity from his work on 1972's The Dunwich Horror. Beginning with an abstraction of Blacula's self-satisfied grin, the sequence moves into minimalist representations of bat and man, the pieces ever-shifting, moving towards other forms. The figure kneels, seemingly suffering, and finally burns, enveloped in red flames. In the final scene, emerging from the red and from bits of black ash, is that grin, whole once more. 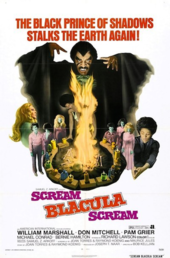 Can Blacula ever truly be vanquished?